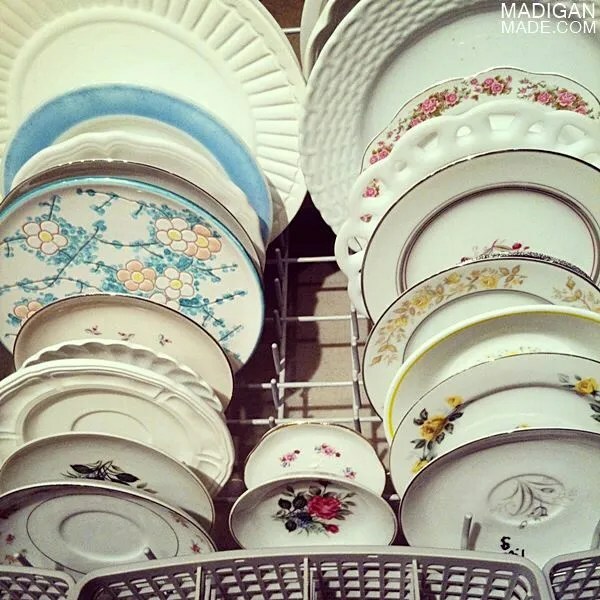 Madigan made… advice for hunting for vintage dishes. Confession: Pretty vintage plates make me smile. You? If you follow me on Instagram or Facebook, then you know that I’ve been collecting vintage plates this year. 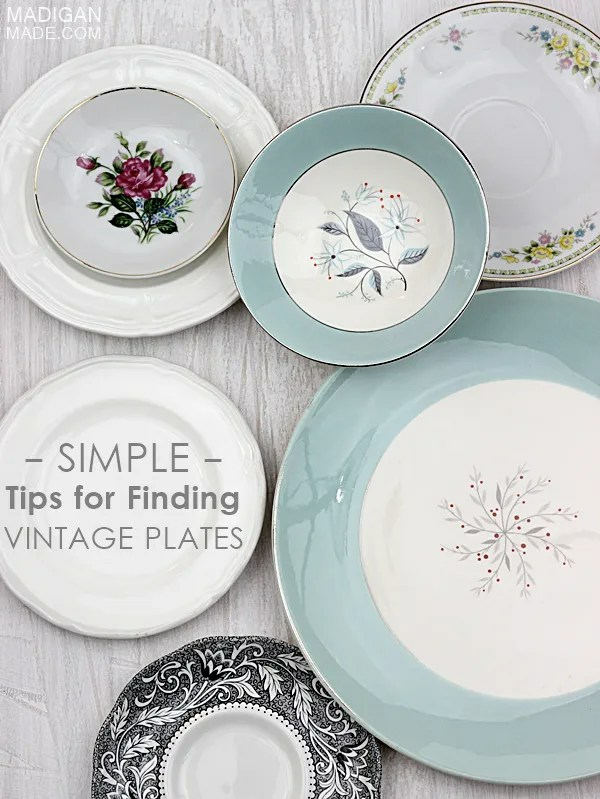 Reader Danielle asked me on Facebook where I found all of my vintage plates. It was a great question… because I realized that not all of you may have shopped for a vintage treasure yet. I’m going to share with you my top places to source old dishes and which resources I prefer. But I need to caution you that shopping for old dishes is an adventure. It takes time to find them… but the hunt is half the fun. I love decorating with plates (like the plates I changed around my big chalkboard) and collecting them can be a little addicting. Consider yourself duly warned, ‘kay? Antique stores and boutique online stores. I love antique stores and boutique Etsy/Ebay stores, but they will be the most expensive places to shop. I find that they have the most mark-up. The selection of plates from these sources will be curated and likely of high quality… but I’ve seen dishes run from $5 dollars up to $25 and higher. That can add up if you need a lot of plates. However, if you don’t have the time to shop and have the cash, antique dealers might be the way to go. Part of the reason some of the dealers’ plates are pricey is because the plate might be a collectable or popular item. I’m just looking for something pretty to decorate my home with… I don’t really care that the design is rare or made by so-and-so. So, unless I absolutely can’t live without it, I often pass on antique store plates. I did buy an Indian Tree patterned platter for $15 at an antique store this spring… I love the image and the pink, yellow and grays in it! Sometimes, it is worth the splurge. I’ve never had much luck at garage sales for cute, old dishes. You’ll likely get a bargain price for a plate at a yard sale… But I find that these sales can be very hit or miss. If you frequent garage sales, keep your eyes peeled. Have patience and be willing to hunt and you might find a treasure or two. 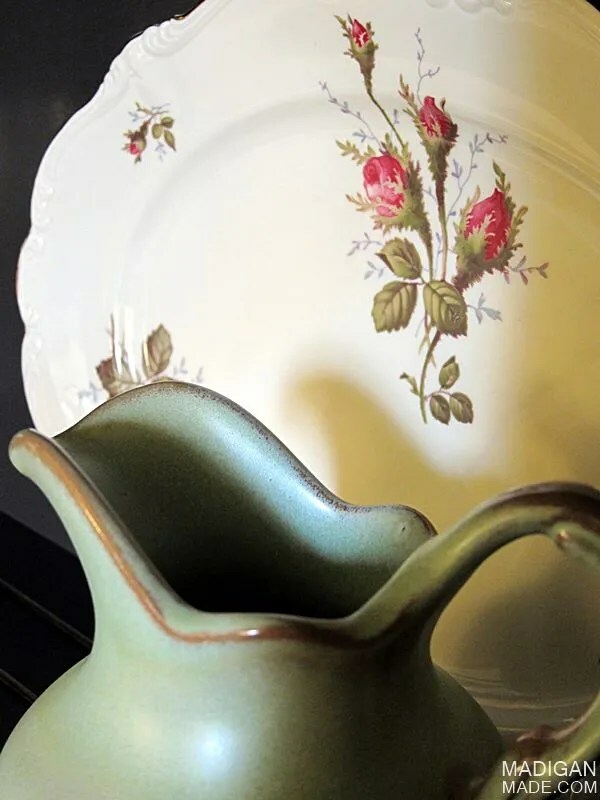 One tip: go to a thrift store near a well-established, older neighborhood… one where there might be a population nearby that is older who may be donating their dishes. For example, a thrift store near a new development of houses with younger families may be a good place to source children’s clothes… but senior neighbors may be more likely to have (and then donate) older dishes to their local thrift shop. Your family and friends’ homes. You’d be surprised. Not everyone loves a good vintage rose plate (gasp!). Or your Aunt Tilde may be trying to downsize and wants someone in the family to have her 3 sets of china. 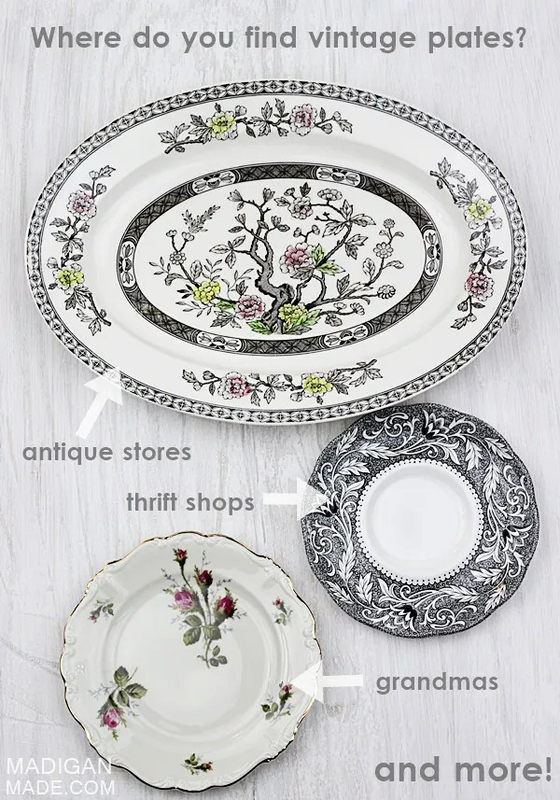 Let your family know you are looking for wall décor/pretty plates and see if anyone is willing to part with their old, pretty dinnerware. I feel incredibly lucky to have inherited some of my grandmother’s china. 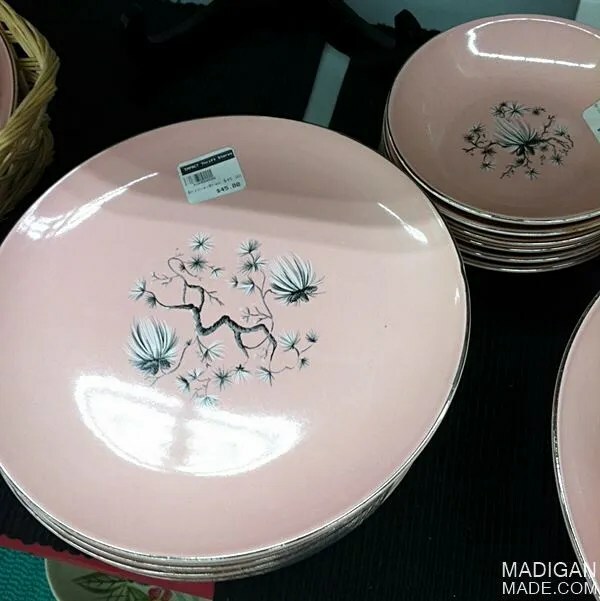 The dishes have simple roses on each of them in a deep, dark pink. I have a few pieces sitting out in our home and we use some of the plates as serving dishes when we entertain. It is both personal and pretty. The vintage look is trendy and retailers are starting to notice. If you don’t have the time to buy the real stuff, look to see if anything ‘new’ moves you at the store. I’ve spotted some vintage-looking plates at Home Goods. I also saw a few plates online from Martha Stewart, Anthropologie and Target that were vintage-inspired. Decide if you need sets or a loner. Most second-hand dishes are either sold in a set… or individually. If you needed dishes for an apartment, you can find a cute set of dishes for a bargain at thrift stores. I’ve been looking for single plates in different patterns, so I gravitate toward the ‘loners’! And sometimes, it hurts to pass by those pretty sets. I know. You get excited when you see vintage plates (me too! )… but you don’t need all them. Shop with a plan in mind. Where are you going to use this? What room? Do you need a lot of them? Or just a few? What colors will work best in your home? I have been looking for vintage plates for a project for my family room for the past year. I had a color palette in mind when I shopped: pinks, yellows and turquoise-y blues (and some blacks/grays). I also was very selective about the floral pattern. I gravitated towards floral graphics that were simple and crisp vs. complicated or soft. Follow your gut. If you don’t completely love the dish, put it back and wait for the one that speaks to you. Also, inspect your piece for chips and dings. Sometimes a few chips can add a little decorative charm hanging on a wall… but I would hesitate to reuse them to serve food. Those chips in the glaze can be a harbor for bacteria. (Yes, that is the healthcare worker in me coming out!) If the pattern was a little faded, I did not mind. It all depends on what you plan to use your plate for. Research what you bring home. NOTE: This is where I tell you to do what I say, not what I do. It depends on what your plan to use your plates for… but as I already mentioned, I just buy plates because I think they are pretty. But, before you do decide to paint your dishes or alter them to hang them on your wall… look at the markings on the back. Do a quick search online (via search engines and Etsy / EBay) to see if maybe you picked up a rare, valuable plate. More than likely you didn’t, but you never know. Do I do this? … um… no. Should I do this? Yeah, probably. Gold rim edges or not, all the plates I bring home get a quick trip through my dishwasher. Something about that makes me feel like I sterilized the plates and removed that second-hand ick factor. Please don’t pack those pretty plates away in a box! You worked hard to find them… Show them off! Hang plates on your walls. Use them to serve stuff. Store your jewelry on them in your bedroom as a vanity tray. Don’t hide that vintage goodness! This past year I collected a lot of dishes. A ton! I promise, I will be showing you what I did with all of my plates in the coming weeks. I’m not quite finished with my project but I am getting SO excited with how it is coming along. Can’t wait to share with you!